Over the past few years, I done a lot of work in making sound, sound of all kinds, which led me from doing electroacoustics and recording my friends overblowing clarinets to wanting to study sound design, which led to me studying at Salford Uni which is where this blog started… over time I’ve accumulated vast folders of audio that’s just sitting around, being useless. And that’s sad. I’m making this short post as a promise to myself to upload more sounds to Free Sound. I have a tonne of files from my H2N field recorder marked ‘Zoom (x)’ which are so old I don’t even know what they are. Anyone who has read my blog might have noticed I spend a lot of time talking about YouTube, and of course I spend a lot of time (one might say, too much!) watching what various YouTube channels have to offer. I’ve seen a lot of great short films, comedy skits and webseries, but sadly I’ve noticed a recurring theme in some of them – the same sound effects. For example, over and over and over again, I’ve watched people get punched to the exact same ‘smack’ tone. I’ve heard the same ‘pigeon wings fluttering’ when a flock of birds fly off… well you get the picture. These people are making great videos, but they end up relying on the same CDs of bought sound effects, rather like relying on the same royalty-free music tracks as everyone else (*Cough* Incomptech *cough*). I don’t blame the video makers in the slightest, but wouldn’t it be great if there were more sounds out there, and that more people knew about the stuff already out there? Free Sounds is a website for creative commons sound effects, that anyone can upload to (it is moderated, but just for accurate description etc. mostly.) I’ve talked about it here before, but honestly I never get sick of how great this site actually is. It’s sound effects, and they’re free, often even for commercial use. Awesome. I mean, I get that some people are still suspicious of creative commons. Why would you give your work away? Well, honestly I’m not using any these sounds, plenty of them were made for students projects, some for fun, some are good quality, some aren’t, but even the low quality stuff might be useful to someone. It’s a great feeling when someone messages you to tell you that washing up sound you created whilst testing a borrowed RN-09 over a year ago turned out to be just what they needed in their radio play. Also, I don’t feel this resource undermines the great professionally produced that are for sale out there. There’s still a place for those – in professional or semi-professional production. But it allows anyone who wants to make films, plays, audio dramas, anything involving sound, a place to go for everything they need. 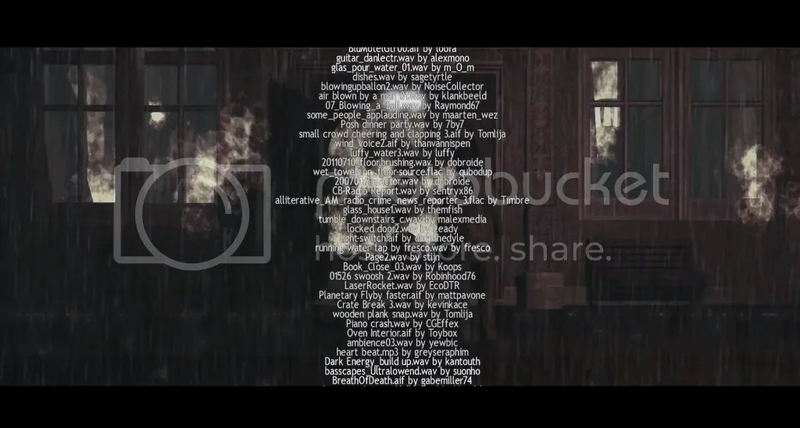 As proof, here’s the credits of Lucius, a famous indie-made horror game from last year. Every single sound in a game which was designed to be extremely creepy/atmospheric (with moments of graphically bloody violence) was from FreeSound.org. Without that, the developers might have been dependent on a smaller selection of sounds that, while high quality, could have been limiting and even cut into budget used for other things. So there, just wanted to share the love for this site and others like it, and maybe encourage someone to upload their sounds – you never know where they might end up!